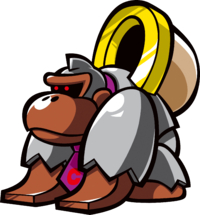 Capture Kongs are gray monkey robots found in the Mario vs. Donkey Kong series, debuting in Mario vs. Donkey Kong 2: March of the Minis. If a Mini Mario touches one, the Capture Kong will capture it, and put it in the sack on its back. The player cannot use that Mini Mario anymore, unless a Fire Mini Mario burns the Kong or a Mini Mario hits it with a Hammer. However, doing this will only stun it temporarily. Capture Kongs can collect an indefinite amount of Minis, and can end the level in failure if all the Minis are trapped. Capture Kongs walk back and forth across level terrain, including spikes, but cannot jump. In Mario and Donkey Kong: Minis on the Move, they get a slight redesign. The "C" on their ties are changed to a "W" and the sack on their backs are replaced with a barrel. The red eyes are also noticeably bigger. This design was reverted in Mario vs. Donkey Kong: Tipping Stars, where they act the same as in their debut game, but the barrel on their back was kept. Italian Cucca Kong "Cuccare" is a colloquial word for "to take", so "Taker Kong"
This page was last edited on March 19, 2019, at 16:12.